Dividend Per Share (DPS) is the total amount of dividendDividendA dividend is the share of profits a shareholder receives, made on behalf of the corporation. When a company genearates a profit and accumulates retained earnings, those earnings can be either reinvested in the business or paid out to shareholders as a dividend. Types include: cash, common, preferred, stock, property attributed to each individual share outstandingWeighted Average Shares OutstandingWeighted average shares outstanding refers to the number of shares of a company calculated after adjusting for changes in the share capital over a reporting period. The number of weighted average shares outstanding is used in calculating metrics such as Earnings per Share (EPS) on a company's financial statements of a company. 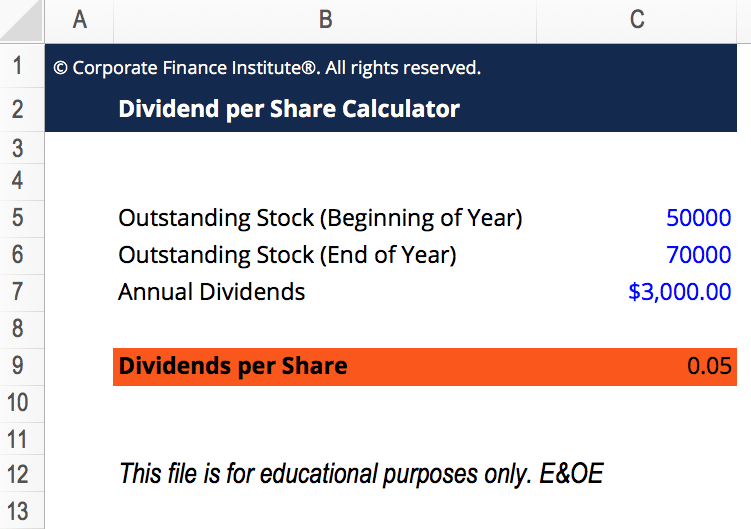 Calculating the dividend per share allows an investor to determine how much income from the company he or she will receive on a per share basis. 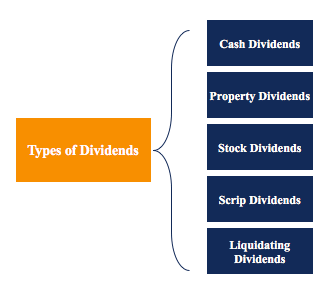 Dividends are usually a cash payment paid to the investors in a company, although there are other types of payment that can be received (discussed below). This is the most common form of dividend per share an investor will receive. It is simply a cash payment and the value can be calculated by either of the above two formulas. The company issues a dividend in the form of an asset such as property, plant, and equipment (PP&E)PP&E (Property, Plant and Equipment)PP&E (Property, Plant, and Equipment) is one of the core non-current assets found on the balance sheet. PP&E is impacted by Capex, Depreciation and Acquisitions/Dispositions of fixed assets. These assets play a key part in the financial planning and analysis of a company’s operations and future expenditures, a vehicle, inventoryInventoryInventory is a current asset account found on the balance sheet consisting of all raw materials, work-in-progress, and finished goods that a company has accumulated. It is often deemed the most illiquid of all current assets, and thus it is excluded from the numerator in the quick ratio calculation., etc. The company gives each shareholder a certain number of extra shares based on the current amount of shares that each shareholder owns (on a pro rataPro-Rata RightA pro-rata right is a legal term that describes the right, but not the obligation, that can be given to an investor to maintain their initial level of percentage ownership in a company during subsequent rounds of financing. basis). The company promises payment to shareholders at a later date. Scrip dividends are essentially a promissory notePromissory NoteA promissory note refers to a financial instrument that includes a written promise from the issuer to pay a second party – the payee – a specific sum of money, either on a specific future date or whenever the payee demands payment. The note should include any terms that relate to the indebtedness, including when and to pay shareholders at a future date. The company liquidates all its assets and pays the sum to shareholders as a dividend. Liquidating dividends are usually issued when the company is about to shut down. Company A announced a total dividend of $500,000 paid to shareholders in the upcoming quarter. Currently, there are 1 million shares outstanding. The dividend per share would simply be the total dividend divided by the shares outstanding. In this case, it is $500,000 / 1,000,000 = $0.5 dividend per share. Net income is generally the last item on the income statementIncome StatementThe Income Statement (or Statement of Profit and Loss) shows performance from operations of a business. The financial statement begins with revenues and. The number of shares outstanding can typically be found on the company’s balance sheetBalance SheetThe balance sheet is one of the three fundamental financial statements. These statements are key to both financial modeling and accounting. The balance sheet displays the company’s total assets, and how these assets are financed, through either debt or equity. Assets = Liabilities + Equity. If there are treasury shares, it is important to subtract those from the number of issued shares to get the number of outstanding shares. Dividing net income by the number of shares outstanding would give you the earnings per share (EPS)Earnings Per Share Formula (EPS)The Earnings Per Share formula is a financial ratio, which counts net earnings against the total outstanding shares over a fixed period of time. A higher EPS ratio indicates a company’s ability to generate profits for common shareholders..
Estimate the typical payout ratio by looking at past historical dividend payouts. For example, if the company historically paid out between 50% and 55% of its net income as dividends, use the midpoint (53%) as the typical payout ratio. 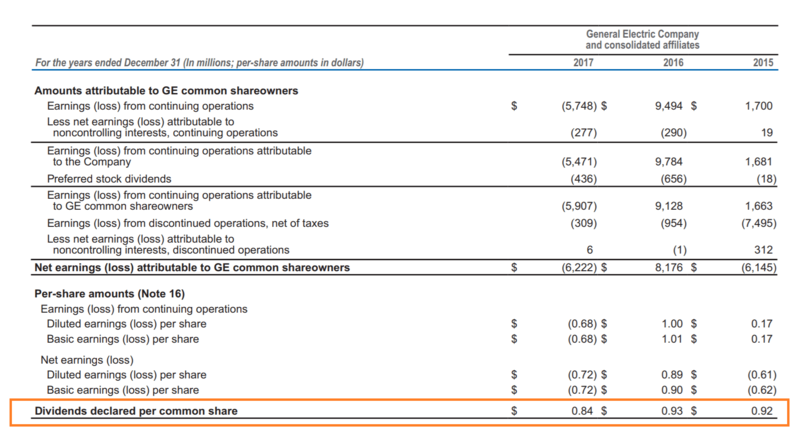 Company A reported a net incomeNet IncomeNet Income is a key line item, not only in the income statement, but in all three core financial statements. While it is arrived at through the income statement, the net profit is also used in both the balance sheet and the cash flow statement. of $10 million. Currently, there are 10 million shares issued with 3 million shares in the treasury. Company A has historically paid out 45% of its earnings as dividends. The net income of this company is $10,000,000. The number of shares outstanding is 10,000,000 issued – 3,000,000 in the treasury = 7,000,000 shares outstanding. $10,000,000 / 7,000,000 = 1.4286 net income per share. The company historically paid out 45% of its earnings as dividends. 0.45 x $1.4286 = $0.6429 dividend per share. Below is an example from GE’s 2017 annual report. In their financial statements is a section that outlines the dividends declared per common share. For easy reference, you can compare the dividends to the net earnings per share (EPS) in the same period. Many investors enjoy receiving dividends and view them as a steady income source. Therefore, these investors are more attracted to dividend-paying companies. Paying a dividend to shareholders may be a signaling method by the company. Dividend payments are typically associated with a strong company with positive expectations about its future earnings. This makes the stock more attractive and may increase the market value of the company’s stock. A company that is growing rapidly most likely won’t pay dividends. The earnings of the company are instead reinvested to help fund further growth. A mature company may hold onto its earnings and reinvest them. The money may be used to fund a new project, acquire new assets, or pursue mergers and acquisitions (M&A)Mergers Acquisitions M&A ProcessThis guide takes you through all the steps in the M&A process. Learn how mergers and acquisitions and deals are completed. In this guide, we'll outline the acquisition process from start to finish, the various types of acquirers (strategic vs. financial buys), the importance of synergies, and transaction costs. If a company originally issues dividends but decides to pull back on its dividend payout, it can create unfavorable signaling for the company. When companies eliminate or reduce their existing dividend policy, this is typically viewed negatively by investors. Therefore, companies may avoid paying dividends at all to avoid this problem. Financial Modeling Valuation and Analyst GuideFMVA™ CertificationThe Financial Modeling & Valueation Analyst (FMVA)™ accreditation is a global standard for financial analysts that covers finance, accounting, financial modeling, valuation, budgeting, forecasting, presentations, and strategy.